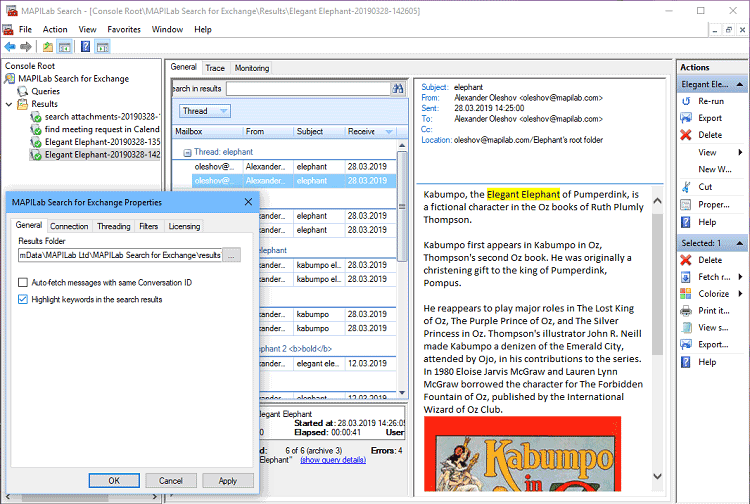 MAPILab Search for Exchange is a solution intended for searching e-mail messages and other elements in multiple mailboxes on Microsoft Exchange server. The product is a awesome assistant for e-discovery-related tasks and urgent IT-administration issues. The presented version of the software (v.1.9) is fully compatible with the latest Microsoft Exchange Server 2019. Another essential improvement is related with the product's UI - now the searched keywords are highlighted in the text of found emails. This smart simple feature allows you to reach out the required content easily just take a look to the message's text. Finally, the user can restart searching by mailbox via context menu on the 'Monitoring' tab. Also the failed searching is marked now and the 'Status' column provides the error details.